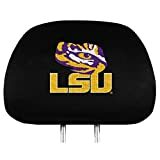 Detail your vehicle and show your team pride with these NCAA Head Rest Covers by Team ProMark. Each head rest cover measures approximately 14-inches by 10-inches. The black cover is decorated with your favorite NCAA embroidered team colored logo and features a elasticated bottom band that fits any size. Comes in a 2-pack set, perfect for gift giving. 14″x 10″ Black Head Rest Covers (pair) with centered embroidered team logo on front. Elasticized bottom band helps it fit virtually any size or shape head rest.